Watching someone smell their wine, swirl it around and gargle the first sip, then rattle off all kinds of information about the wine might seem intimidating. However, even casual wine drinkers can learn the art of wine tasting. It’s not overly complicated once you understand the basics, and the wine experts at Acquistapace’s can help. Visually inspect a glass of wine under neutral lighting to examine its color, opacity and viscosity, aka wine legs. You can discover several things about wine just from its appearance. This includes the wine’s approximate age, because white wines tend to change color and red wines tend to lose color over time. You also potentially can learn the grape varieties used in the wine, climate where the grapes were grown, and amounts of acidity, sugar and alcohol contained in the wine. Discover clues you didn’t pick up on from your visual inspection with a trained nose. A wine’s aroma gives away nearly every detail about it. While smelling wine to identify aromas, think big to small and in broad categories. For example, if you smell fruits, are they orchard, citrus or tropical fruits? 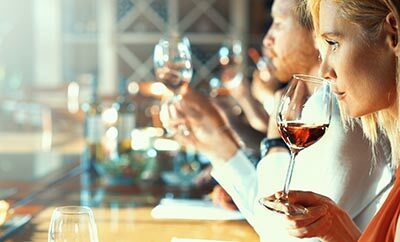 Divide your olfactory inspection into primary aromas from grape varieties and fruit, herbs and floral notes; secondary aromas from the winemaking process; and tertiary aromas from aging. Alternate between small, short sniffs and long, slow sniffs. Also, swirling wine in the glass doesn’t just look cool, it actually releases more aroma compounds into the air for you to smell. Your tongue picks up where your nose left off, and picks up things smell can’t, like sweetness. Coat your mouth with a large sip of wine, followed by several small sips. This helps you isolate and differentiate between flavors, so you can focus on one flavor at a time. Taste whether the wine’s structure is sour, sweet or bitter. Notice the texture, which is increased with higher alcohol content. Make note of the tannins, which causes a drying sensation in red wines. These steps allow you to develop a complete profile of a particular wine and tells you whether you liked it or not. Our wine experts at Acquistapace’s Covington and Mandeville locations in Louisiana can help you select wines to practice your tasting skills. Refine your palate with a mixture of red and white wines from our impressive selection of 6,300 wines from around the world. Have a question about wine? Do you have a general question about our products? Let our expert staff answer it for you! Please fill out the form below. We may be helping someone in the store at the moment, so your question will be responded to within 24 hours. If you need immediately assistance, please call us at 985-893-7554. Thank you!